Zodiac director David Fincher will helm Black Hole for Paramount Pictures and MTV Films, according to Variety. 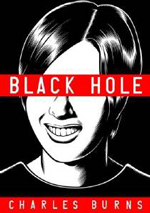 Alexandre Aja had originally been tapped to direct the film adaptation based Charles Burns’ 12-issue comic book series, which took the author over a decade to complete and was compiled into graphic novel form in 2005. Beowulf co-scrbes Roger Avary and Neil Gaiman signed on to adapt the screenplay in March 2006 (see Gaiman and Avary Enter the ‘Black Hole’). Black Hole centers around a sexually transmitted disease called “the bug” that’s plaguing the local teenagers with hallucinations as well as physical deformities, stigmatizing them from the rest of society. Fincher next directs Brad Pitt and Cate Blanchett in Paramount’s The Curious Case of Benjamin Button, set for theatrical release on December 19, 2008.